Freddy Maloney Petrified Wood Graduated Row Bracelet size 7"
We're committed to petrified wood as a stone to be set in Traditional Revival Navajo jewelry. So many pieces from the 40's through the 70's were set with petrified wood and it's such a unique material. We've never had much luck selling it, but the artists who use it in their work are some of the most committed traditional silversmiths now working and we love this stone. 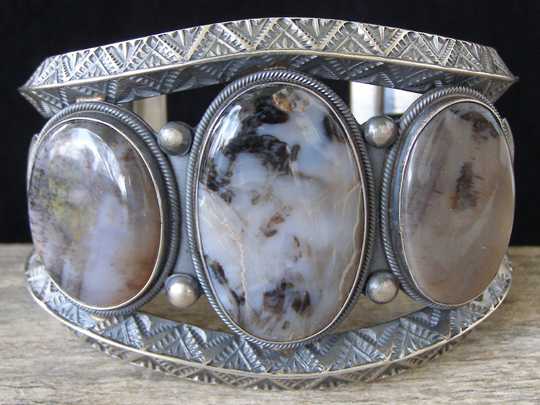 This is a classic bracelet made in the style of yesteryear. Freddy used two lengths of heavy-gauge triangle wire to form this cuff and did a splendid job of deep-stamping the two exposed surfaces of the triangle wire. In the center of the cuff, he used three lengths of square wire sandwiched together. Look closely at these lengths of wire. The square piece sandwiched between the two other pieces is the same type of wire. The outer lengths are square wire that has been twisted so that the squared corners of the wire form a rotating spiral like the threads of a screw. Twisted square wire is made by hand from square wire, not made at the factory. Not every silversmith is adept enough to make it. This is a gorgeous bracelet made in a very traditional style by a very fine silveersmith. Hallmarked FM on one of the terminal caps and stamped Sterling on the other terminal cap. Width in front: 2 1/8"
Stones: center 1 7/16" x 7/8"; left 1 1/16" x 7/8"; right 1 1/8" x 3/4"